This machine have double heater to heating the sheet from two side of the sheet. It suitable for both thin and thickness board forming. The material loading is able to use by roll or board both. It can mass production packing blister, disposable food container, biscuit tray, ceiling and it can use sheet materials contain PVC, PS, ABS, PET to make various kinds of boxes, cases, such as cake boxes, meal boxes, toys, sanitary wares, etc. It also fit to make decoration on soft PVC, for make the special decoration on sheet surface. Such as the cone for speaker or PVC sheet make bag, that kinds of sheet surface have some small decoration will able to make by this method also. 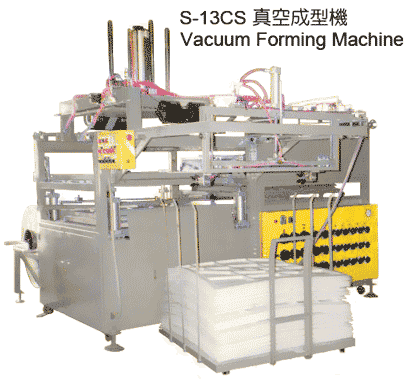 This machine could automatic forming the roll sheet. It also able to use board sheet to loading pieces by pieces.